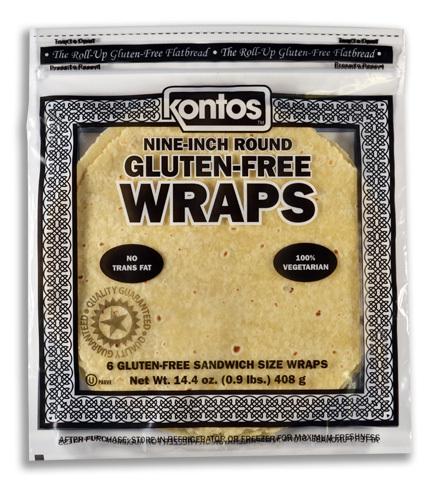 9-Inch Gluten-Free Wrap - Kontos Foods Inc.
A unique wheat-free and gluten-free wrap specifically developed to fit the needs of individuals who are looking for wheat and gluten free options. Ideal for wrap sandwich making. Contains no Trans Fat and is 100% Vegetarian. Ingredients Tapioca Starch, Water, Rice Flour, Soybean Flour, Shortening (Canola Oil, Palm and Palm Kernel), Food Starch Modified, Potato Starch, Contains 2% or Less of the Following: Yeast, Baking Powder (Calcium Acid Pyprohosphate, Sodium Bicarbonate, Corn Starch, Monocalcium Phosphate, Calcium Sulfate), Whole Eggs, Fumaric Acid, Mono and Diglycerides with Citric Acid (a Preservative), Maltodextrin, Dextrose, Xanthan Gum, Egg Whites, Calcium Propionate (to maintain freshness), Salt. Allergens Contains Soybean and Egg.